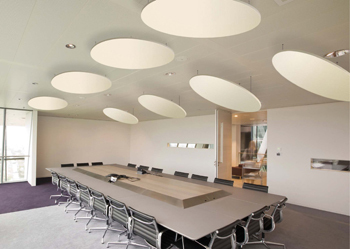 Cloudsorption shaped suspended sound absorbers for ceilings can be suspended from a ceiling to create a ‘cloud’ effect. Suspended sound absorbers are much more efficient at reducing reverberation noise or echo within a room because it absorbs from both sides of the panel. 100% of our clients have expressed their satisfaction with the result. 50% of those clients have re-commissioned us to install the Cloudsorption panels in other areas of their premises, ie, following on from a trial installation. Cloudsorption sound absorbers are now available in a variety of shapes including a wavy edge to resemble clouds, hence the name. When these are suspended at different heights from a ceiling they create an interesting cloud effect appearance that is also efficently absorbs reverberent noise within a room. Reverberent noise is when sound bounces off all of the hard surfaces within a room creating an echo effect. This echo effect makes it more difficult to hear people when they are speaking. Once the Cloudsorption shaped panels are installed the echo effect is diminished and the more sound absorbing panels there are the greater the improvement will be. 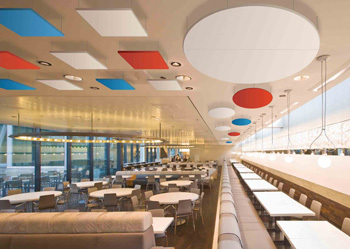 Shaped Cloudsorption sound absorberss are designed for use in schools, offices, studios, restaurants, airport lounges, and any room where reverderated noise is a problem.. Shaped Cloudsorption can also be supplied as triangles, circles, pentagons andhexagons. Please call us for more information and prices.